The Chicago Blackhawks are one of the NHL’s oldest team. A wealth of great players have donned the iconic sweater during the team’s 90-year history. 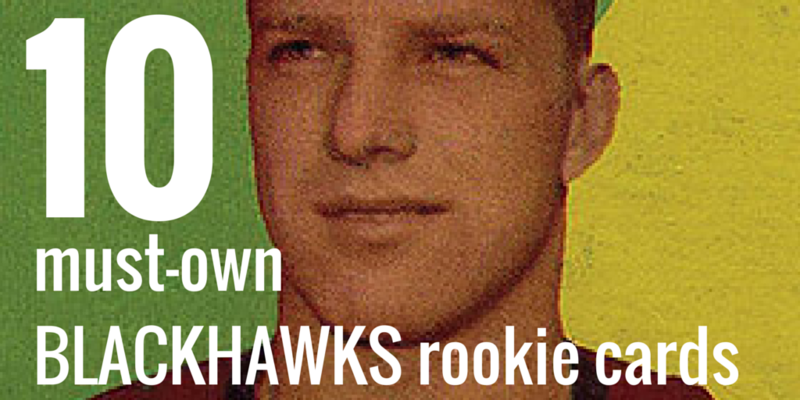 Anyone who collects cards and considers themselves a ‘Hawks fan should really track down rookie cards of these 10 all-time great players. Some cost $1, others $10 and some well over $100, but if you get them all they will form the foundation of an impressive Blackhawks collection. But first, two quick caveats on how I formed this list. The player has to be pictured as a member of the Blackhawks. The player had to achieve their greatest success with the Blackhawks. With that said, the start of our list should come as no surprise to anyone. 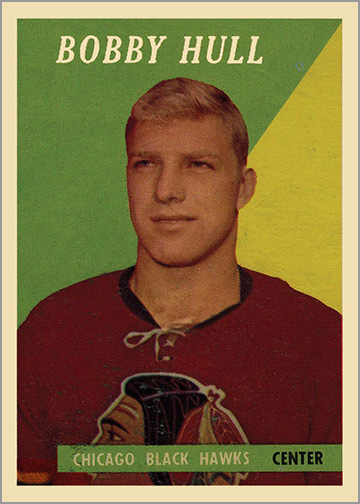 Bobby Hull skated fast, shot the puck hard and didn’t shy away from the physical stuff. He was a First Team All-Star for 10 times and a Second Team All-Star two times. Hull also won the scoring title three times and was league MVP twice. Factor in his movie star good looks and it is no wonder that “The Golden Jet” was so immensely popular during his 15 years in Chicago. 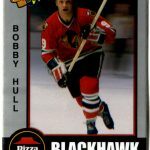 The cards on this list may make the foundation of a great ‘Hawks collection, but a Bobby Hull RC is the cornerstone. It isn’t cheap, though. 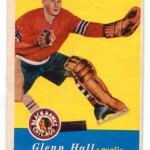 Not only are hockey cards from the 1950s tough to come by, but Hull’s card is the last card in the 66-card set. Often times back then, collectors — not as concerned with condition as we are today — would bundle sets with rubber bands, meaning that the first and last cards in old sets are prone to have rubber band marks. Finding a Hull in decent shape is no small task. 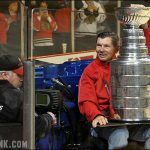 Stan Mikita is the all-time leader for the Blackhawks in seasons (21), games played (1394), assists (926) and points (1467). He was also one of the most dominant players in the 1960s, winning the Art Ross Trophy as the league’s leading scorer four times and the Hart Trophy as the league MVP twice. Mikita was one of first NHL superstars who went against popular opinion and wore a helmet during the latter half of his career. As if that didn’t make him enough of a trailblazer, he also co-invented the curved stick blade with Bobby Hull. 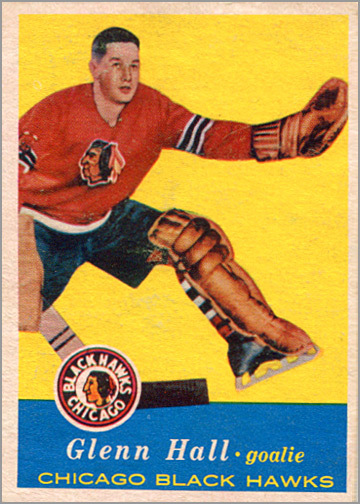 Mikita’s rookie card — the most desirable RC in the 1960-61 Topps set — has a simple, elegant design. The blue and yellow background rectangles combine with the red of Mikita’s uniform to form a primary color triad that is harmonious to the eye. Also notice how Mikita’s stick intersects the horizontal and vertical lines formed by the color boxes. The diagonal stick and two white boxes in the background add a sense of movement to an otherwise static composition, making this card more pop art than mere collectible. Glenn Hall is credited with developing the butterfly style of goaltending. He played in 502 consecutive games — a record no other goalie will ever beat — without the benefit of wearing a mask for protection, won the Vezina Trophy three times, played in 13 NHL All-Star Games, was named a First Team All-Star seven times and a Second Team All-Star another three times. No wonder he earned the nickname “Mr. Goalie.” Legend has it that Hall vomited before every game he played, too. Like Mikita’s rookie card, Hall’s RC also utilizes yellow and blue colors. 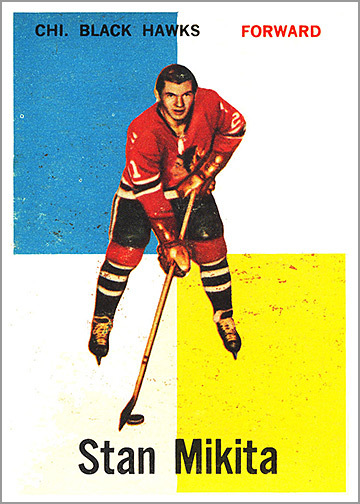 The bold use of red and blue, with the loud yellow background, make this hockey card sort of resemble the famous World War II “We Can Do It!” poster. Although a horizontal layout would have better accommodated the photo, in a way it is kind of cool that Hall is cut off at the left; it is as if this card could not contain Hall as he makes the save. 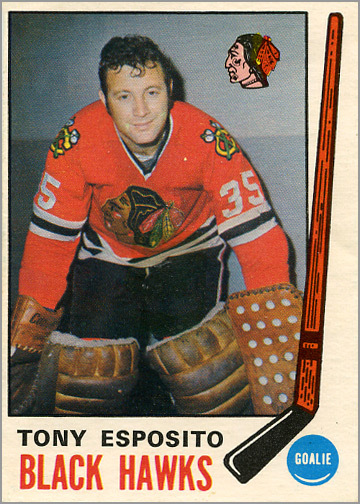 Tony-O was the goalie for the ‘Hawks in the 1970s. He manned the pipes for Chicago from 1969 to 1984. His career in Chicago started with a bang, as he won the Calder Memorial Trophy as the NHL rookie of the year and posted 15 shutouts — a record for most shutouts by a rookie netminder. Along the way, Esposito won the Vezina Trophy three times, was a First Team All-Star three times and a Second Team All-Star twice. He was also a member of Team Canada during the 1972 Summit Series against Russia. There is nothing remarkable about the appearance of this card, and yet that is what makes it so perfect for a goalie like Tony Esposito. Goalie masks became commonplace in the 1970s, and most goalies chose to have their masks painted in some manner. But not Tony-O who wore a plain white mask in his 15 seasons in Chicago. Hence, a mugshot of a young Esposito in front of a bland, nondescript wall is a wholly appropriate photo for a goalie who had such a no-frills mask. NOTE: While these first four cards sell for over $100 each, officially licensed reproductions were made of these cards in the 2002 Topps/OPC Archives set, which can be found for a few dollars each. These reprints were produced on glossy, high quality card stock, but have a gaudy, gold-colored “Archives” logo that detracts from the card’s visual appeal. Just as the Stan Mikita era of the Blackhawks was ending, the Denis Savard era was beginning. 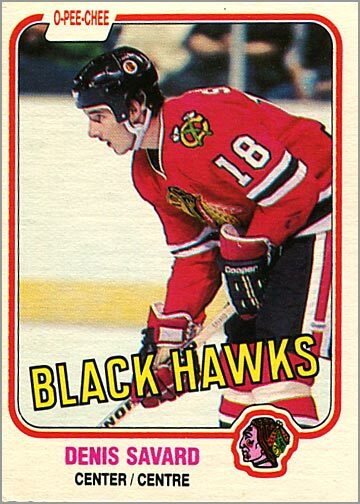 “Savvy” was the Blackhawks go-to player in the 1980s. He was a fast-skating center who could beat all six opponents on the ice. He is third all-time in team scoring behind Mikita and Hull, and still remains a fan favorite today. 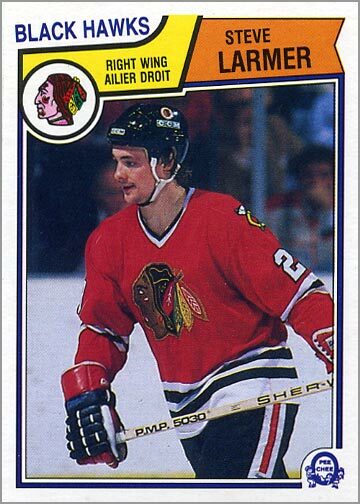 Steve Larmer was the poster child for consistency during his 11 seasons with the Blackhawks. He won the Calder Memorial Trophy as the NHL rookie of the year, and was a point-per-game player in his 13-year NHL career (1012 points in 1006 games). 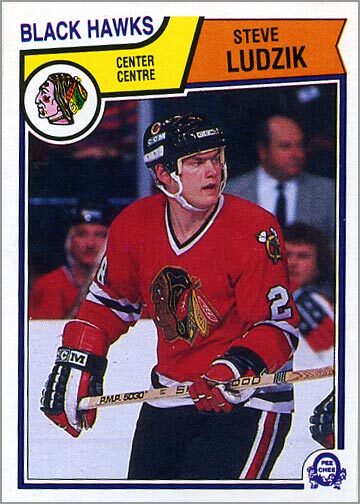 What elevates his status as one of the Blackhawks all-time greats is that Larmer played in 884 consecutive games for Chicago, never missing a game in 11 years. That’s third all-time for consecutive games played in the NHL, and the most consecutive games with a single team. Despite winning the Calder Trophy in 1983, O-Pee-Chee accidentally put teammate Steve Ludzik on Larmer’s card, and Larmer’s photo on Ludzik’s card (more on that here). Thus, you really need to own both cards, as one has Larmer’s name and stats, while the other has his picture. When Tony Esposito retired in 1984, the Blackhawks were unable to fill his skates. Every year between 1984-85 and 1989-90, a new netminder was deemed the starter, but none of them panned out. Then Eddie Belfour, who grew up idolizing Esposito, made a splash in 1990-91, winning a team-record 43 games that year — along with the Calder, Vezina and Jennings Trophies. 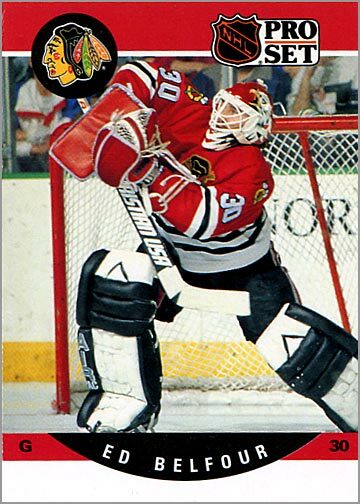 “The Eagle” was the Blackhawks’ number one goalie from 1990-91 to 1996-97, and won the Vezina again and the Jennings three more times that decade. 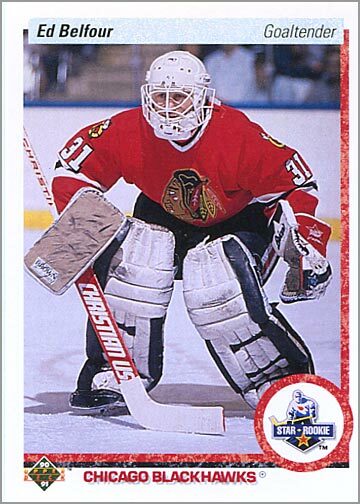 Belfour has rookie cards in the 1990-91 Bowman, Pro Set, Score Traded and Upper Deck sets. His Upper Deck card (left) is most interesting, as it shows him from his brief stint in 1988-89; this was before Belfour would don the famous “Eagle” mask that led to his nickname. If you’d rather have an RC that shows the Eagle mask, then his Pro Set card (right) has the best view of it. But all four of his rookie cards can be found for around $1 each, so why not get them all? Jeremy Roenick was a contradiction of sorts. He was a fast skater and a gifted goal scorer. He netted 513 goals and 703 assists in his 20-year NHL career. But he also played a physical game, never afraid to check an opponent or go into the corner for a loose puck. Had he shied away from the physical stuff, Roenick would not have gotten injured as much and would have had even higher numbers. But his mix of physical play, scoring talent and his outgoing personality is what made him so endearing to fans. Roenick had a good rookie year in 1989-90, so not surprisingly he has rookie cards in all eight of the sets issued in 1990-91. Trading cards that year were ridiculously overproduced and most of Roenick’s RCs can be found for next to nothing. However, his O-Pee-Chee Premier card wasn’t as grossly overproduced, and retains a bit more value ($3 to $5) than his other cards (around $1). That’s probably his best RC to own. Or do what I did and collect all eight different Roenick rookie cards. After the Blackhawks traded Roenick in 1996 and Chris Chelios in 1999, they did not have a truly marquee player until Jonathan Toews and Patrick Kane joined the team in 2007-08. Toews legacy started right away, as he scored his first goal on his first shot in his first game. Since then, he was named team captain in his second season, led the team to two Stanley Cup Championships, was the playoff MVP in 2010 and the league’s best defensive forward in 2013. His story is far from over. Toews had numerous cards issued during his rookie season of 2007-08. Some are inexpensive, like his cards from the O-Pee-Chee, MVP and Victory sets and can be found for under $10. Others, from sets like The Cup, can sell for $500 or more. 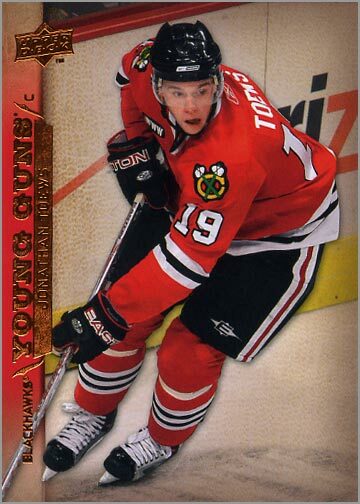 My personal favorite is his 2007-08 Upper Deck “Young Guns” rookie card (pictured), which features a bright, crisp action shot and can be found for under $100. Patrick Kane has lived up to the expectations foisted on a first overall draft pick. He won the Calder Trophy as the NHL’s rookie of the year in 2008. In 2010, he helped lead the ‘Hawks to the Stanley Cup Championship, scoring the series-clinching goal in overtime. Three years later, he won the Conn Smythe Trophy as playoff MVP as he led Chicago to their second Stanley Cup in four years. Plus, he’s only 26 and like Toews has many great years of hockey ahead of him. Most current NHL players today have pretty sad-looking autographs, consisting of a few squiggles and maybe a barely-decipherable number. But like his play, Kane’s autograph is a cut above, and actually looks pretty nice. His 2007-08 SP Authentic rookie card (pictured) features a great on-card autograph in blue ink and, at 999 copies, isn’t too pricey. 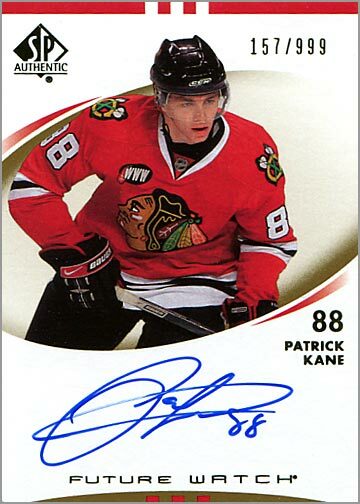 But again like Toews, Kane has a plethora of rookie cards from different sets, ranging from $5 to $500, so all collectors can find a card that fits their budget. Special thanks to The Want List for the images of the Hull and Mikita rookie cards. Note: This article was originally published on June 11, 2015. Great list Sal, I can’t think of anyone that I’d sub in over these 10. That was an enjoyable read for sure. 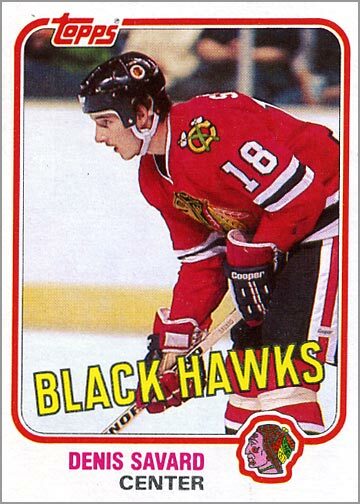 I’m not sure it would replace any of the 10 cards here, but I always liked Dennis Hull’s rookie card, with each letter in Black Hawks appearing over the pucks across the top. What? 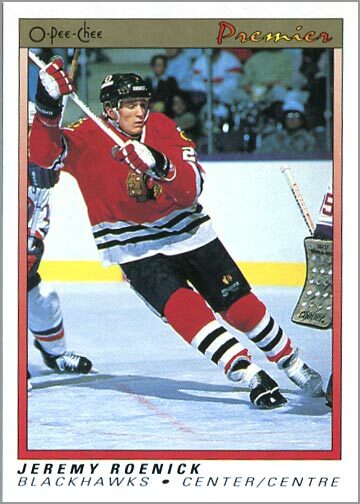 A Blackhawks rookie card list without Tony Amonte, Eric Daze, or Sergei Krivokrasov is a travesty of justice. Amonte played for Rangers in his first years. It’s too bad Ken Yaremchuk never got a card. He certainly would be on this list. 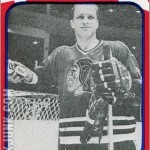 Ken Yaremchuk didn’t have a hockey card, but he was in the Blackhawks team postcard set from 1984–85. Duncan Kieth Top 11 list. 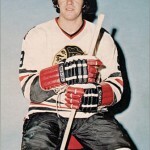 Phil Esposito?–certainly in terms of value, if not long term service to the Hawks. Ugh! The Blackhawks 2nd-worst trade, right behind trading Dominik Hasek for Christian Ruuttu.